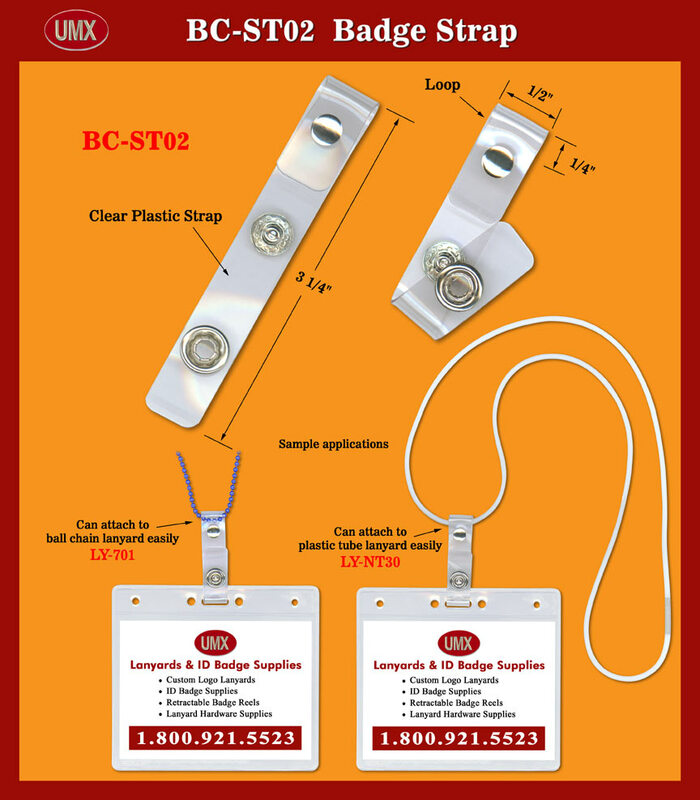 BC-ST02 name tag holder straps comes with durable metal riveted loops designed for round cords, ball chains, strings or plastic tube lanyard to go through it easily. The 1/4" plastic loop is big enough for most of ball chains, 1/8" round cords, plastic tubes to go through. It can be use to hook up your ID card or name tag holder to your lanyards or other hanging devices. They are 1/2" wide by 3 1/4" long plastic name tag holder straps. The clear plastic name tag strap come with snap button can snap on your ID badge holders easily. You are viewing Lanyards > Badge Clips > Clear Plastic Name Badge Holder Strap with Metal Riveted Loops for Ball Chains, Cord or Plastic Tube Lanyards to hook up ID cards or name badges.